Home > Shop By Brand > 303 Products > 303 Fabric Guard 16 oz. 303 Fabric Guard 16 oz. The 303 Fabric Guard is a powerful protectant that will keep your convertible top looking great on the road! How versatile is this for you: Now you can protect your tennis sneakers, your leather bomber jacket, your pool furniture, and your convertible top with the same protectant! 303 products, the makers of the ever-popular 303 Aerospace Protectant, have created a product for all “outdoor” fabrics. The beauty is that you can bring the outdoors inside, treating fine leathers and suedes, and even silk with this solution. Protects Fabric. 303 Fabric Guard protects all new or cleaned “outdoor” fabrics from water, dirt, grease and sun damage. 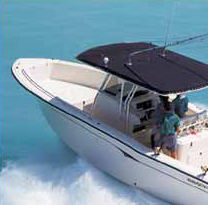 Outdoor fabrics include canvas convertible tops, cloth automobile seats and carpets, biminis, and boating enclosures. You aren’t limited to just outdoor fabrics, though, 303 Products advises that this exceptional protectant is a useful protective product for fine leathers, silk, footwear, and sporting apparel. Repels spots and stains. 303 Guard resists soiling and mildew formation, by restoring an effective level of lost water repellency. The non-scientific meaning of this is that you will not be plagued by spots and stains left from water seepage within the fibers of the fabric. No Silicone. Silicone water repellents may repel water just as well as this product, but that’s where the similarities end. 303 Fabric Guard will also repel oil, soil, grease, and dust. Silicone products actually attract dust and soil with a slightly tacky film. Silicone water repellency lasts on average 2-3 months, as compared to 303 Fabric Guard that protects for up to three years on low-traffic fabrics. Silicone has that harsh, pungent smell during application; whereas 303 Fabric Guard has a mild, clean odor. Of course, once it dries, there is no smell at all. Most importantly, 303 Fabric Guard is recommended by industry leaders that include Sunbrella, Dickson, and numerous makers of patio furniture, marine canvas, and awnings…and Autogeek! Great for Boats. If you sail, this is an essential product for sail protection. Also use 303 Fabric Guard on enclosures, and boat and sail covers. 303 Fabric Guard should be applied to new fabrics from the start and on recently cleaned fabrics to prevent future soiling. The product will bond best to clean, dry fibers. The surface should be completely dry, and it’s best to apply Fabric Guard on a warm day in full sun. The amount of 303 Fabric Guard needed depends on the material. One 16 oz. bottle will treat 50-75 sq. ft. of marine canvas. For lighter, thinner fabrics, less product is needed to get good coverage. 303 Fabric Guard should be reapplied at the first signs of re-soiling. 303 Fabric Guard is a versatile and powerful protectant that has the seal of approval from industry leaders, and hopefully you will agree after your first use! Use it on marine canvas, bimini tops, convertible tops, awnings, leather, all outdoor and indoor fabrics. Federal regulations prohibit the shipment of this products by air, UPS 3 Day, UPS 2, or US Mail. This item is shipped by UPS Ground only. Sorry but no APO or FPO addresses. 303 Fabric Guard 32 oz. 303 Fabric Guard 128 oz. Never received my free sample. ProsRepels water very well. Lasts a long time. Used it on olefin cushions from a patio sofa. Now water beads up instead of soaking through this "water resistant" fabric. But it used most of a 16-oz. bottle for three cushions, so it will be expensive if it has to be reapplied. Discount deal was helpful, but shipping seems high for as long as it took. I followed directions precisely. Shortly after application, the water did roll of the convertible top cloth material. However, a few days later the water seemed to saturate the fabric the same as prior to application. I had the same experience three years earlier.